2. In a heavy saucepan, sauté garlic and onion in olive oil for about 5 minutes over medium heat. 3. Add diced tomatoes, red pepper flakes and salt. Bring to a boil, then reduce heat to a simmer for about 10 to 15 minutes. Set aside. 4. Combine egg, ricotta cheese, quick - melting cheese and basil in a medium bowl. Mix well. Set aside. 5. In a large baking dish, spread about 1/3 of the cooked tomato sauce on the bottom. Layer zucchini on top of the tomato sauce. Spread 1/2 of the ricotta mixture on top of zucchini slices. 6. 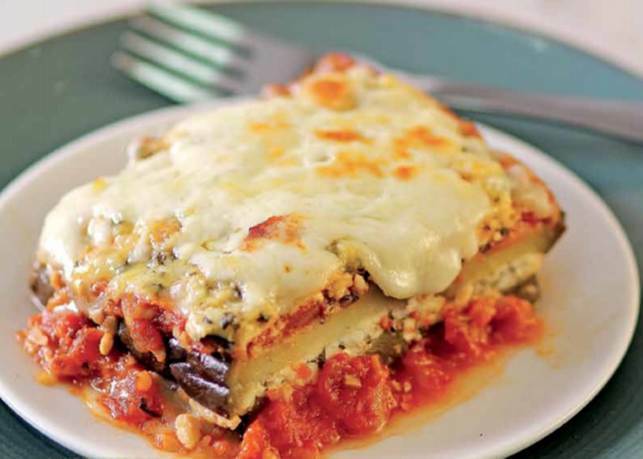 Make a second layer of eggplant slices, tomato sauce and remaining ricotta cheese mixture. 7. Top with remaining sauce, mozzarella cheese and Parmesan cheese. Cover baking dish with aluminum foil. 8. Bake covered for about 30 minutes. Remove foil and bake for another 10 minutes or until cheese is slightly browned.